On 24 July 2014 Natsha set off at 09:45, flanked by many supporters on the first of a new type of challenge. 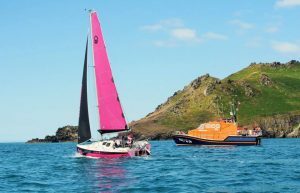 The idea of this challenge was for her to daysail from Cowes, via Poole, Portland, Lyme Bay, Exmouth, Dartmouth, Salcombe, Plymouth, Fowey, Falmouth, Newlyn, Lands End, Padstow, Appledore and eventually to Swansea. She got a fantastic welcome at every port of call. The last part of this challenge was to climb Pen y Fan in her Hart Walker frame, a 2907 ft high peak in South Wales. On completing this challenge we raised £15,606 which was shared by the Ellen MacArthur Cancer Trust, RNLI and RYA Foundation. Natasha wasn’t stopping here though, plans quickly developed for another challenge the next year. For the full low-down on the Sea and Summit challenge you can read/download a PDF of the full story by clicking here or you can read the news from the challenge at the bottom of this page or review the challenge in the video playlist below. (Click the next and previous buttons to move through the video clips) This is the route Natasha took, recorded using a Yellowbrick tracker. Hover over the map and use the mouse wheel to zoom in and out or click on the arrow by the YB logo for a larger version. – Miss Isle Completes Sea And Summit Challenge! Teenager with cerebral palsy sails 430 miles in boat she controls by ‘sipping and puffing’ a straw. A teenager who struggles to move or talk has just completed a epic sailing journey from the Isle of Wight around the south western coast of England to Swansea. On Thursday she completed the tough 60 mile trip from Newlyn to Padstow taking her past the treacherous Runnelstone Reef off Porthcurno and around the many hidden rocks at Land’s End. 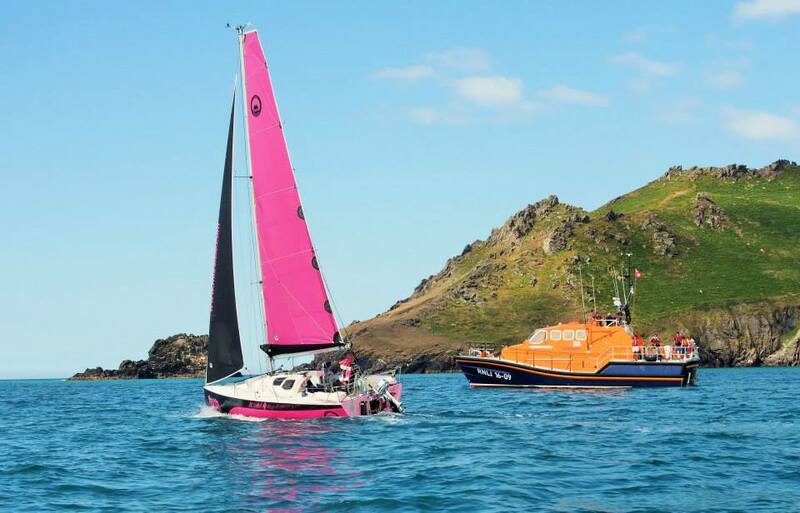 She completed the longest leg of her voyage in 11 hours, arriving into Padstow harbour to warm applause on schedule at 4pm. (This article is no longer available online). A teenager with cerebral palsy is sailing over 400 miles in a specially developed boat which she controls – by blowing through a tube. Inspirational Natasha Lambert, 17, uses a ‘sip and puff’ system, which her electrician dad designed, after she took a shine to sailing.